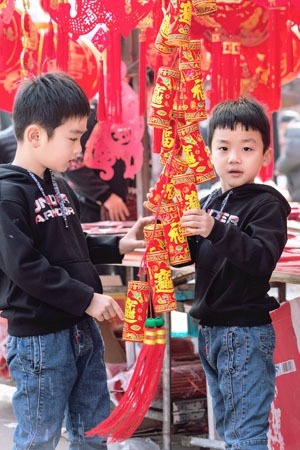 It is an important custom to set off firecrackers and fireworks during the Chinese New Year period. Chinese New Year celebrations would not be complete without them. 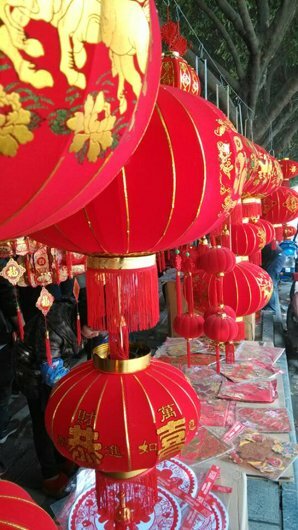 Why Light Firecrackers on Chinese New Year? 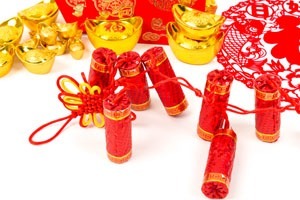 In traditional Chinese culture, firecrackers were originally used to scare away evil spirits. As the legend goes, a monster called Nian would come out to eat villagers and destroy their houses on each New Year’s Eve. The villagers discovered that burning dry bamboo to produce an explosive sound scared away the monster. Since then, it has become a tradition at Chinese New Year. Click to learn more on Legends of Chinese New Year. Today, lighting firecrackers and fireworks is a major custom to celebrate the coming of the New Year, and also a way to enhance the festive atmosphere. So, even though lighting firecrackers produces a loud noise nuisance and piles of red paper shreds, Chinese people not only take it in their stride, but also they generally enjoy firecrackers. Baozhu in Chinese, literally meaning "exploding bamboo", was the predecessor of firecrackers. In the Tang Dynasty (618–907), gunpowder was discovered by chance, which led to the invention of firecrackers in China. People found that a loud blast could be produced by inserting gunpowder into the hollow of a bamboo stick and then throwing it into a fire. The first firecrackers were born. In the Song Dynasty (960–1279), paper tubes came to replace the bamboo stalks. 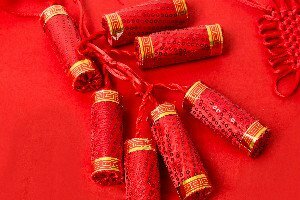 Wrapped in red, a lucky color for Chinese, firecrackers became increasingly popular to enhance celebrations and religious ceremonies. The red paper is left around (for at least a day) after letting off firecrackers, so as not to "sweep away good luck". 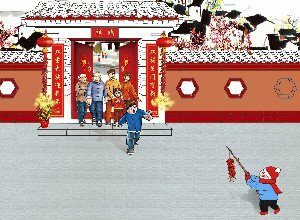 Before New Year&apos;s Eve dinner: When the reunion dinner is ready, many families light firecrackers to invite ancestors to celebrate the festival together. It is also a way to add a jubilant atmosphere to the festival and it brings great happiness. At the stroke of midnight on New Year&apos;s Day: It is customary to stay up until midnight after the reunion dinner. Firecrackers and fireworks are set off at the stroke of midnight to scare away evil spirits and celebrate the coming of the new year. The moment the new year arrives, there is a cacophony of fireworks and firecrackers all around, accompanied by thick smoke, the shaking of buildings, and the noise of hundreds of car alarms. In large cities, fireworks are set off continuously for one to two hours. On New Year&apos;s Day morning: In some places, families first set off firecrackers when they open the door or before they go out. It symbolizes good luck throughout the whole year. Many families will not sweep the red paper left by firecrackers immediately because they believe that the act of sweeping on this day is associated with sweeping wealth away. 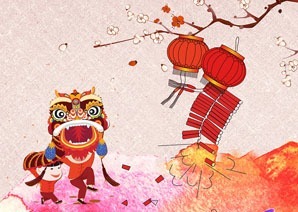 The Lantern Festival: It marks the end of the celebration of Chinese New Year. People set off firecrackers and fireworks to ward off misfortune and bring good luck. Click to see What Chinese Do to Celebrate Chinese New Year. Firecrackers are commonly used in celebrations of holidays or festivals. There are many other occasions where firecrackers are used, such as wedding ceremonies, seniors&apos; birthday parties, house warming parties, and the opening of a business. They are used to bring blessings and happiness. Setting off firecrackers is not always used for celebrations. 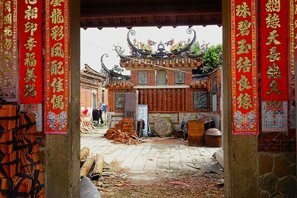 In the Qingming Festival and at funerals, the use of firecrackers is to honor the dead. For the sake of safety and environmental protection, many cities across China have imposed bans or restrictions on the use of fireworks and firecrackers during festivals and holidays. In these cases, it&apos;s illegal for individuals to set off fireworks and firecrackers. People can only set them off at designated venues. If you would like to see a show of firecrackers and fireworks in a city, you need to check the designated venues and time frames in advance.Hong Kong is a great place to see fireworks. During Chinese New Year, there is an annual fireworks show over Victoria Harbor. Click to learn the 4 Best Cities for Chinese New Year 2019.